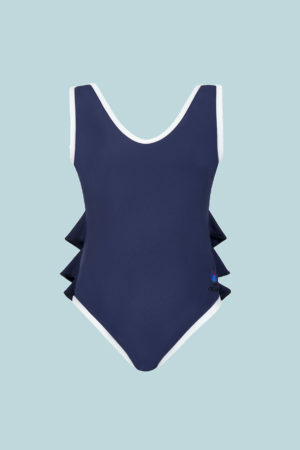 One piece with white profiling, round neckline in front and small ruffles on the back. 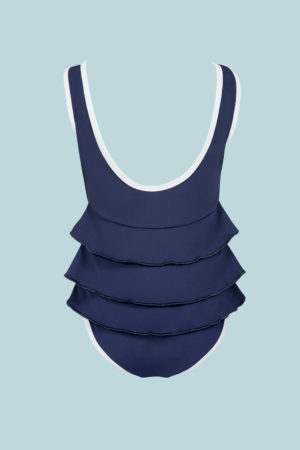 The model inspired by our Universal costume, matches perfectly for a “mini-me” look has been developed in the SoloBlu xOne Ocean capsule, studied in detail to ensure eco-sustainability and the lowest possible impact on the pollution of our seas. The garment is entirely made with the highly performing ECONYL® yarn, to offer the most innovative swimwear, without forgetting quality and attention to fit. Today, thanks to research and innovation, fishing nets abandoned in our seas are transformed together with other nylon waste into a new raw material, reborn as top quality yarn. The ECONYL® regeneration system guarantees respect for the environment, because it continues indefinitely, in a responsible life cycle, creating a positive impact on our climate and ecosystem worldwide.